Joseph Chamie is former Director of the United Nations Population Division. NEW YORK, Apr 1 2019 (IPS) - Two, four and eight billion people is the extraordinary doubling and redoubling of the world’s population that occurred in slightly less than a century. 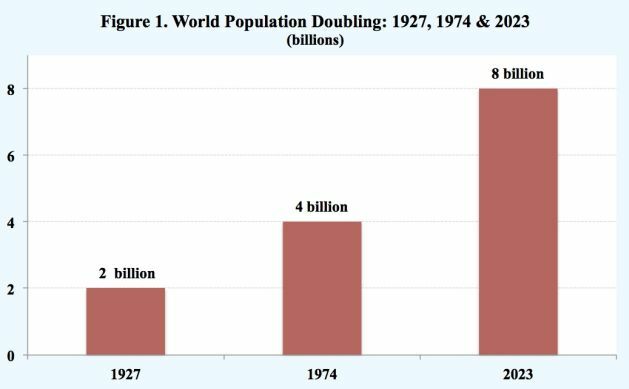 World population, which had grown to 2 billion by 1927, doubled to 4 billion by 1974 and will reach 8 billion by around 2023. Is that record-breaking demographic growth of world population likely to be repeated in the 21st century? The short answer is: while a doubling of world population over the course of the 21st century is possible, its quadrupling is not in the cards. In the late 1960s the growth rate of the world’s population peaked at 2.1 percent and has since declined to approximately half that level, or 1.1 percent. The annual addition to the world’s population also peaked in the late 1980s at nearly 93 million and is now about 82 million per year. The primary reason for lower levels of world population growth is the decline in fertility rates or the average number of births per woman. At the beginning of the 20th century average global fertility was still about six births per woman. By 1950 world fertility had declined only slightly to five births per woman, with less than a handful of countries having rates below the replacement level. During the second half of the 20th century, however, birth rates dropped relatively rapidly across most countries, resulting in today’s world fertility level of about 2.5 births per woman (Figure 2). Powerful forces, which continue to operate today, brought about the declines in fertility primarily during the second half of the 20th century. Particularly noteworthy among those forces were lower mortality, increased urbanization, widespread education, improvements in the status of women and modern contraceptives. Survival of the young, migration from rural areas to urban centers, education and employment of women contributed greatly to the desire of couples, especially women, to delay, space and limit childbearing. Not so long ago, the attempts of women and men to time and limit their number of children were resisted, with some countries having laws preventing the distribution of contraceptive materials and information. Throughout the 20th century especially following the Second World War, public attitudes, government policies and personal behavior changed markedly regarding birth control and contraception. In the early 1960s modern contraceptives, notably the oral contraceptive pill, became available to married women and subsequently to unmarried women. Today nearly two-thirds of women aged 15 to 49 years who are married or in a union are using contraceptives, with close to 60 percent of them using a modern family planning method. However, one in ten married or in-union women aged 15 to 49 years, or approximately 142 million women, want to stop or delay childbearing but are not using any contraceptive method to prevent pregnancy. The availability of the oral pill and other modern contraceptive methods permitted couples to gain control over the number and timing of their births. The ability for both women and men to determine the timing and number of births is certainly a major achievement having enormous demographic, social, economic and political consequences. Although mortality levels continue to play an important role in the growth of world population as it has throughout human history, fertility rates constitute the critical determinant of the future size of world population. If birth rates remain unchanged at current levels, a highly unlikely scenario given recent trends, the world’s population would reach 26.3 billion by the end of the century (Figure 3). 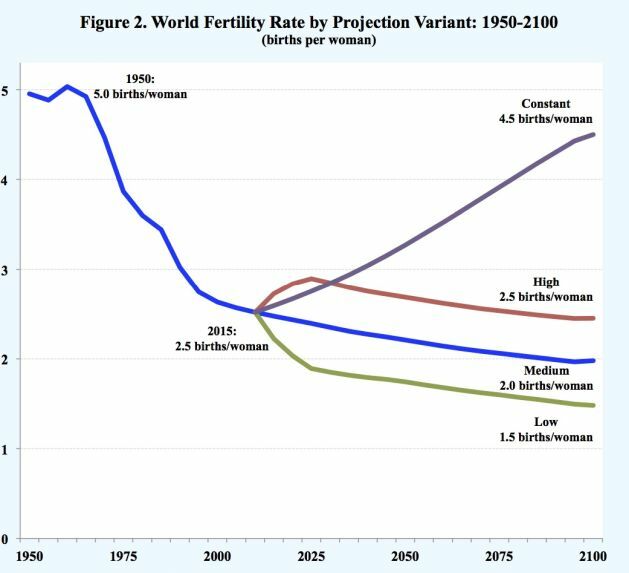 If fertility rates continue their decline and move to the replacement level of about two births per woman, which is the United Nations medium variant, world population is projected to be 11.2 billion in 2100. A half child above and below the replacement level yields the United Nations high and low variants for world population of 16.5 billion and 7.3 billion, respectively, at the close of the century. While world population is not likely to quadruple in the 21st century, the populations of approximately three-dozen countries, largely in sub-Saharan Africa, are projected to more than quadruple during this century according to the United Nations medium variant. Africa’s largest country Nigeria, for example, is projected to have its population sextuple over the 21st century, from 122 million at its start to 794 million at its close. The country with the most rapid rate of projected population growth is Niger. Its population is expected to increase seventeen-fold over the 21st century, from 11 million to 192 million, again according to the medium variant. If fertility were to decline more rapidly, the low variant, from its current 7 births per woman to 4 births per woman by mid-century and to the replacement level of 2 births per woman by the century’s close, Niger’s population would increase nearly thirteen-fold to 144 million during the century. Moreover, even if its fertility rate were to fall immediately to the replacement level, the instant replacement variant, Niger’s population is projected to triple to 37 million over the 21st century. In contrast to the countries with populations that are projected to more than quadruple, the populations of some 50 countries are projected to decline during the 21st century, according to the medium scenario. Moreover, 30 of those countries are expected to experience population declines of at least 20 percent over the current century. Japan, for example, is projected to have its population decline by 34 percent over the 21st century, from 128 million to 85 million. China, the largest population among this group of countries, is expected to see its population of 1.3 billion in 2000 drop to 1.0 billion by 2100, a decline of 20 percent. The most rapid population declines during the 21st century of approximately 50 percent are projected for Bulgaria, Latvia and Moldova. In terms of absolute numbers, ten countries account for 62 percent of the projected world population growth between today and the close of the century, which is approximately 3.5 billion according to the United Nations medium variant (Figure 4). 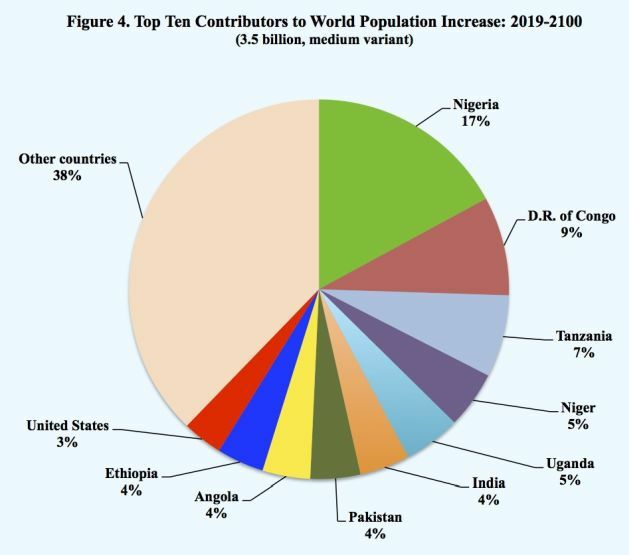 Of those countries, the top five contributors to population growth in the 21st century are in sub-Saharan Africa: Nigeria (17 percent), Democratic Republic of Congo (9 percent), Tanzania (7 percent), Niger (5 percent), Uganda (5 percent), India (4 percent), Pakistan (4 percent), Angola (4 percent), Ethiopia (4 percent) and the United States (3 percent). World demographics of the recent past are explicit, detailed and straightforward. The 20th century was the most rapid world population growth in human history. Although dramatic declines in mortality and fertility levels have taken place, the growth of world population continues but at a slower pace than the recent past. It is evident that world population will soon reach 8 billion and will continue to increase well after that demographic milestone. 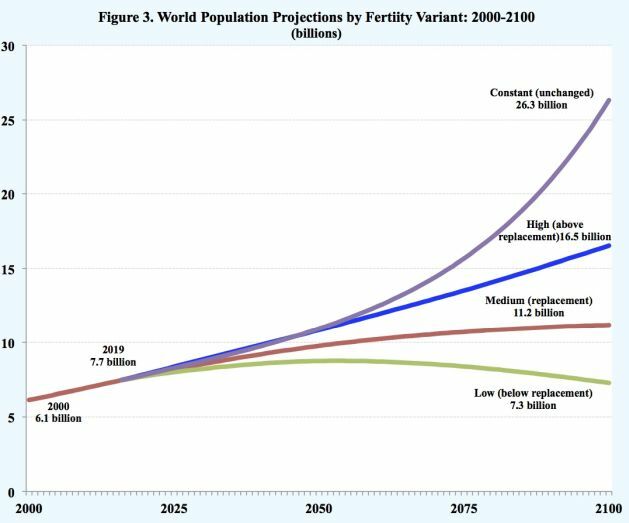 As described above, the future growth of world population will largely be a function of the path of future fertility, especially across the high fertility countries of Africa. Of course, the future of world population remains uncertain and current demographic conditions, particularly mortality and morbidity levels, could change markedly for the worse as has occurred at various times in the past. Nevertheless, population projections for the 21st should not be dismissed as merely demographic soothsaying. Demographic projections provide valuable insight into the most likely future course of population growth and what policies and programs may be needed to address changing demographic conditions and their consequences. A world population of 8 billion people and possibly double that number by the century’s close poses a plethora of critical challenges for humanity as well as the planet’s flora and fauna. Prominent among those challenges, especially relevant for rapidly growing developing countries, are concerns about food, water, housing, education, employment, health, peace and security, governance, migration, human rights, energy, natural resources and the environment. Unfortunately, in too many instances political leaders have chosen to address those critical challenges with the three D’s: Denial, Delay and Do nothing. In order to deal effectively with the many population related challenges of the 21st century, government policies and programs as well as the efforts of international and national organizations should be guided by the three A’s: Acknowledge accurately, Analyze thoroughly and Act prudently. Soon the situation will reverse and then many will complain about the demographic decline as more people leave farms and more women go to work and choose to have far few if any children at all. This is the case in Europe but will become ubiquitous even in the most formerly mostly “underdeveloped” African countries. Ten billion should be the peak before the decline begins to set in. The good news is that robots will pick up the slack. This is alarming news as vital world resources dwindle. Natural disasters will increase as more people face fewer services and facilities. Fecund subsaharan slum- dwellers must practise birth control and leaders should unite under one AU president to end aid and monetise abundant natural resources.